Star Wars inspired party favors were a must when we had Mr. B’s 6th birthday party. With the release of the new movie, Star Wars is everywhere now. You can see the whole re-cap of our Star Wars Inspired party , including the birthday party review HERE, plus all the food HERE. 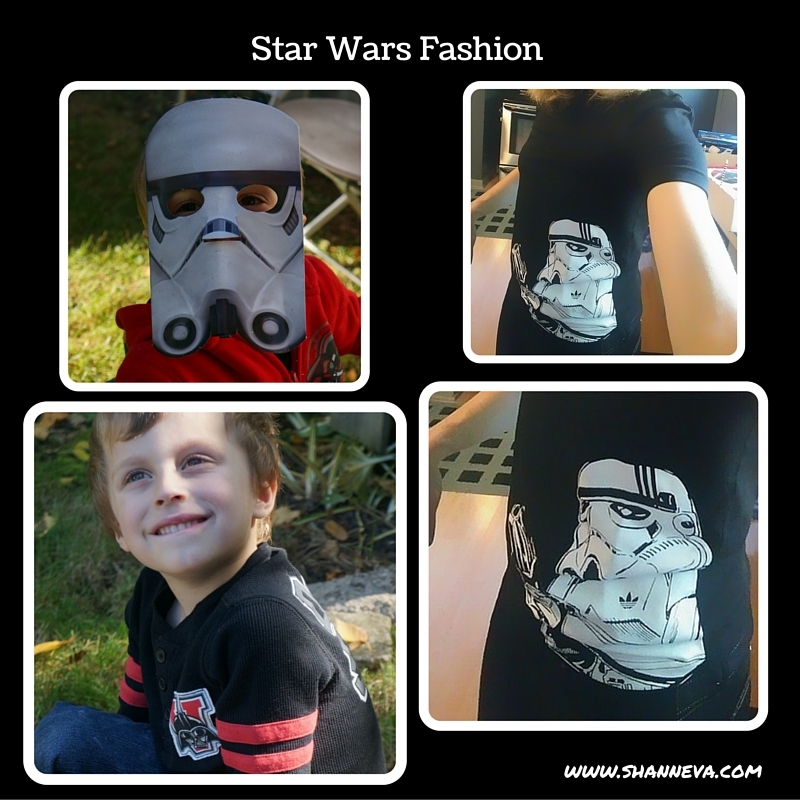 Today, I wanted to share the 2 different Star Wars Inspired Party Favors I made up for the party, plus share a little of our Star Wars Party fashion. This is the last party post…I promise! Since we have a Pinata every year at my son’s party, I wanted to make something for the kids to collect their candy. The first year, I completely forgot bags, and the second I just used store-bought party favor bags. This year, all the Star Wars themed birthday stuff either had the Star Wars Rebels on it, or was super expensive from past years on Amazon. So, I decided to make my own. 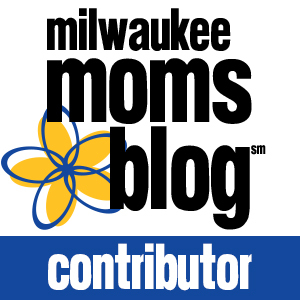 This post contains my Amazon Affiliate links. If you click through the link or picture, you will be taken directly to the product. There is no additional cost to you, and I may make a small commission if you make a purchase. used some black foam sticky paper from Michaels, and a Sharpie Marker. I then looked at a million pictures of Storm Troopers, and just did the face freehand. All 20 of them look different, and that’s OK. The kids didn’t care. They just wanted a place to put their candy. Ps. The box I put them in was just a cardboard one from Sam’s club that I covered in wrapping paper. 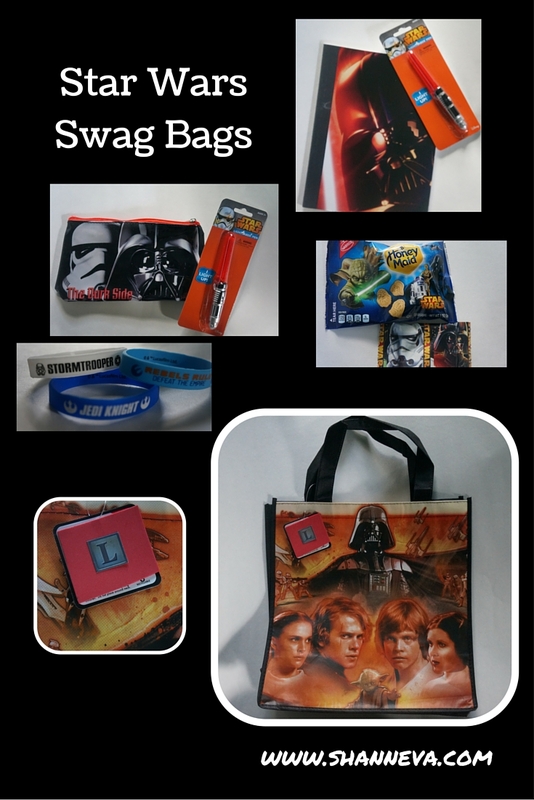 In addition to the candy bags, I like to give everyone a “Swag” bag. I found some really cute Star Wars reusable totes from Target at the Dollar Spot, and found some cute Star Wars themed stuff to go inside. I only gave one bag per family because I didn’t want to go crazy with the cost. The kids didn’t really care about the actual bags…just what was inside. I figured the parents would use the bags somehow (or the husbands could keep them…mine wanted one.) I made sure there was enough stuff for each kid, plus if they had a sibling at home. I then included either a notebook and light saber pen OR a pencil-case and light saber pen. I couldn’t find enough of all the same things on clearance, but I made sure each family’s bag had the same things in it. Then, I waited to hand the bags out as they were leaving, so the kids would be comparing and/or complaining…as I know mine would. Finally, I put each of the kid’s initials on the tags both to personalize, and so I would remember who’s bag was who’s. I used some red sticky foam paper and scrapbook letters. Also, instead of party hats, we used these Star Wars Masks. Feel free to click on any of my affiliate links below to purchase, as no additional cost, to fill your bags. Finally, what party post would be complete without a look at our Star Wars Fashion?!?! I always like to dress the kids in apparel that go with the theme, so this year was no different. I waited and waited and, of course, got everything on clearance. The twins’ sweatshirts and pants were from Old Navy. The jeans even had star wars fabric when you rolled up the cuffs on the bottom. So cute! Their T-shirts were made by Adidas, and I got them at the Adidas outlet…which is also where my T-shirt was from. I had a sweatshirt too, but it was actually too hot to wear it. The awesome Storm Trooper mask is what we used instead of birthday hats. Again, clearance from Target. I hope you enjoyed all of our Star Wars Inspired Party Favors. If you have any questions about making the bags or about any items shown, feel free to leave me a comment. With the new Star Wars out on DVD, will you be having your own party? Can I help decorate? I love all of these details! The bags are beyond adorable, and the goodies inside were a big hit with the kids, I’m sure. Star Wars will always be my favorite Star Wars flick! Cute! And those cardboard boxes from sam’s club are the best! When I had a garage sale this spring we went and grabbed as many of those as we could to organize everything! I love those candy bags! We are MAJOR Star Wars fans in our house. Super cute! I said in one of the other posts how cute I thought these bags were. 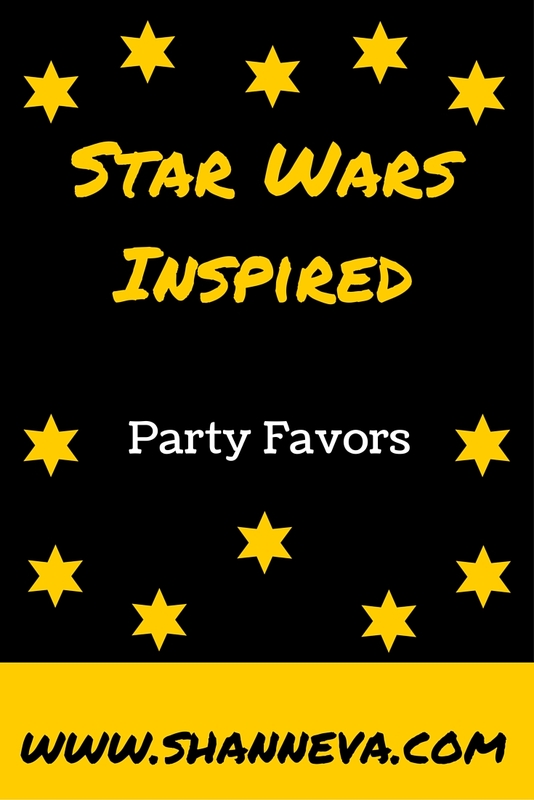 Who could get tired of Star Wars party details?? I think you did an awesome job with all of these little touches. Awe . Thank you do much . This is absolutely adorable! 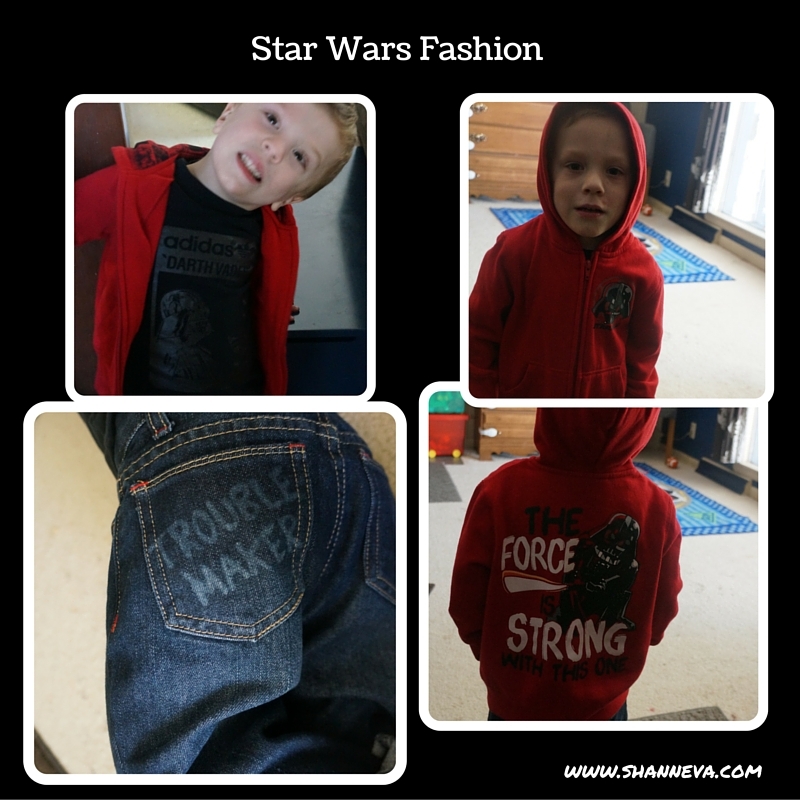 I love the Trouble Maker jeans! My boys love Star Wars, even the teen. He got tickets for the new one. Such a great theme! Love the bags. I bet the kids loved them, too! How fun! I will be sharing this with friends of mine as they are HUGE Star Wars fans and have a little girl who is too and her birthday happens to be next week!!! cute cute cute! I love the shirts and the bags are super cute! Oh my gosh stop making us average moms looks so bad!! 😉 I love what you’ve done. Your ideas are always so creative! Star Wars is such a favorite. What great favors! Very creative. And my amazement continues! Those storm trooper favor bags are so great! Queen of Creative! Awe. You’re too sweet. Thank you. If Kyle still had birthday parties, I would so do this, we love star wars, but we don’t really think it’s best for Sophie at this age just yet, but I love star wars and get Kyle star wars related shirts for his birthday every year. Those party favors are adorable! You are very talented. What a lucky bunch of kids. You truly rocked the theme Shann! I love this, very creative! 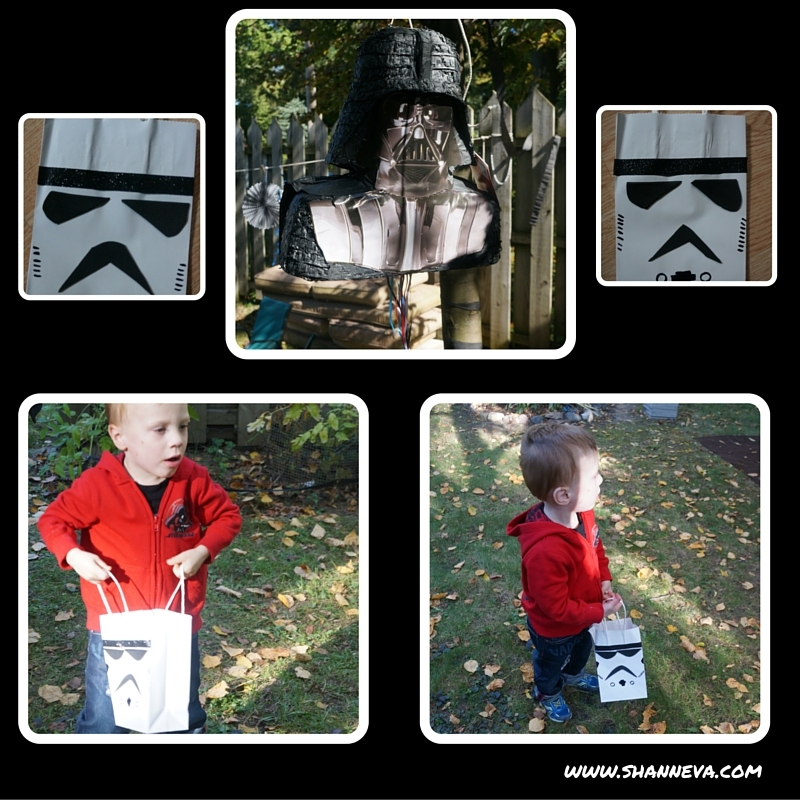 Who would have thought Storm Troopers would make a good bag! Lol. I love your son’s shirts too, very cool! The force is definitely strong here! Love your fun ideas this coming hallowen. I love those bags. I think my boys would love this. They had loads of fun with this I bet? Love kids theme parties! Oh my gosh these are adorable! And I’m amazed how simple they are! Those bags are so cute! I’m going to do that for my sons party in a couple months. He wants a star wars theme this year! 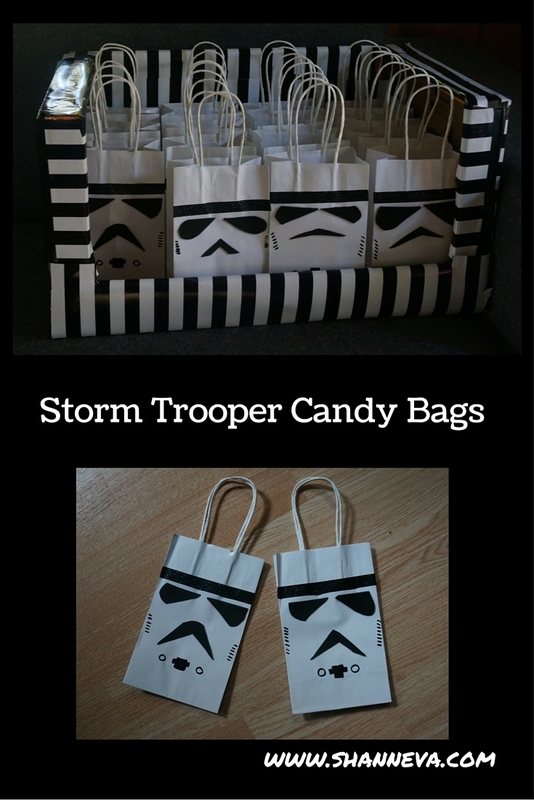 The storm troopers candy bags are so cute! The kids must have fun. Your effort payed off. It seemed like a very good party. These are too cute. My family is looking forward to seeing this movie. Those are cute. My family is looking forward to seeing this movie. Omg those Star Wars goodie bags are the cutest! Such a cleaver idea!!! I love the idea of co-coordinating a movie to a party as a theme and Star Wars is a classic. These are really neat. I can’t wait to watch the new Star Wars movie! It seems like it’s going to be the biggest movie of the year. Wow these are Great! That’s so awesome. ALthough I am not a star wars fan I can definitely appreciate those! those storm trooper bags are awesome! Hynix is so detailed and great. I love the gift bags and the fact all the links are so handy. Thankyou! Stop it! How cute is ALL of this!?!? I love those party favor bags. So creative Shann! Aw look at those! Adorable!! Those gift bags are SO cute! I have to show this to my sister! So fun! One of my biggest wishes in life is that Kit asks me someday to have a Star Wars birthday party. I’m not even kidding haha! It’ll probably never happen, I’m sure she’ll want princesses and sparkles… and that’s okay too, but oh man. I would be so thrilled! Love it! We’re a fan of pretty much anything Star Wars in this house so I’ll be making the bags for sure! These are all such cute ideas! My kiddos (and husband) would go nuts for pretty much all of it!